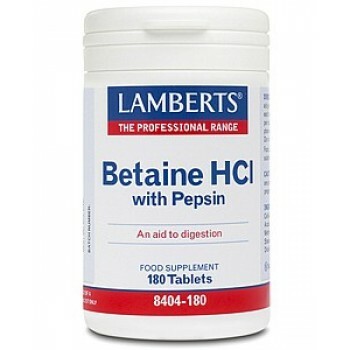 This product provides additional acidity to the stomach since Betaine HCL releases hydrochloric acid after swallowing, the same acid that is produced naturally by the stomach. These tablets are designed to dissolve in the stomach where the acidity is required. As we age our natural production of hydrochloric acid can decline, but its importance for the breakdown of food in the gut remains unchanged. Hydrochloric acid has several different functions; for example it sterilises the ingested food and activates a powerful enzyme called pepsin that breaks down protein, as well as allowing vitamin B12 to be extracted from foodstuffs. DiCalcium Phosphate, Cellulose, Acacia, Magnesium Stearate, Stearic Acid, Silicon Dioxide. Disintegration time: Less than 30 minutes. This product is not recommended for children, or pregnant or lactating women. DO NOT TAKE IF PEPTIC ULCERS ARE PRESENT OR SUSPECTED. Storage instructions To be stored in a cool, dry place and protected from light. 1 tablet with each main meal up to a maximum of 3 per day. Swallow the tablets whole.